Cricket Canada is planning a multi-city league to generate more interest for the sport in the country. "This is just the beginning," Cricket Canada CEO Atul Ahuja told IANS. "Like the National Hockey League [NHL] in North America, we now plan a multi-city league to take cricket to the masses. "We have a five-year strategic plan to take the sport to the grassroots. We want to introduce a multi-city franchise professional league - on the lines of the NHL. Discussions are underway and we are keen that we play this league in the winter months in an indoor arena. We know we can present a world-class league for our spectators and global TV viewers." Cricket Canada, an associate member of the ICC, took a big leap forward in July when cricket became officially recognised by the Canadian government, leaving the sport eligible to potentially receive huge amounts of funding. And under Cricket Canada, the sport has managed to attract top banks and corporates as sponsors. With the help of Scotiabank, Canada hosted its first T20 national league in May. This was followed by an ODI tri-series in King City featuring West Indies, Bermuda and the hosts, in August, where Canada lost the final against West Indies by seven wickets. In October, King City played host to the T20 Canada, the world's first Twenty20 quadrangular series, involving Sri Lanka, Pakistan, Zimbabwe and the hosts. Canada once again came up short, finishing fourth as Sri Lanka beat Pakistan in the final by five wickets. Ahuja, however, said he was not worried about the financial aspect as more sponsors were keen to jump on to the cricket bandwagon after the success of the events this year. "When I took over in 2007, I straightway chose to drive change in key areas like corporate sponsorship, spectator-driven events, year-round training, and bring ICC full-member nations to play here," he said. "For the first time in Canadian cricket, we got corporate sponsorship when Scotiabank signed for a three-year contract to become our national sponsor. "Global TV coverage of these tournaments put Canada on the world cricket map. No other country hosted six ICC members or four ICC full members this year," Ahuja said. It has been an indifferent year for Canada though, winning two of the six ODIs and two of the seven Twenty20 internationals they played. They also finished a disappointing fifth in the ICC World Twenty20 Qualifiers, which featured the top six associate nations, and were third in the 2008-09 ICC Americas Division 1 tournament which saw the USA clinch the title. However, Ahuja said the impetus from future tournaments may result in a turnaround for the game in the country. "We will be hosting the Under-19 World Cup in 2012 and this will be an opportunity for Canada to be counted as 'grown-up' on the world stage - both from governance and performance standpoints. Currently, we are focussing on our U-15 squad to be counted as a winning nation by 2012." Modified from Cricket Umpiring and Scoring by Tom Smith, 1989. Players are reminded that under Law 42, it is the Team Captain who is responsible for the behaviour of a side on the field during a match. The Umpire is given no authority under the Laws to control behaviour during the match. The office of the Umpire has responsibility and dignity. To maintain that status in the eyes of spectators and cricketers, Umpires must never say or do anything to endanger the respect given to their position. It is hard to put up with bad behaviour of players but Umpires are expected to show PATIENCE and COMPOSURE. Even in extreme cases, Umpires should not show their feelings by word or gesture. Law 42 deals with the conduct of players and when it is necessary, the Umpire must follow the procedures for reporting and action that are laid down in the Law. From the beginning of the game, players have been ready to give respect to the Umpire. One of the oldest traditions of cricket is and must always be, THE IMMEDIATE AND UNQUALIFIED ACCEPTANCE OF THE UMPIRE?S DECISION. Appeals may be made quietly by one player ? or they may be loud and made by the whole team. The Umpire must give each kind of appeal equal weight and deal with them in the same manner. The judgement must be made without hurry, by waiting a second or two to consider and then calmly and deliberately giving a decision. Umpires should not offer any form of explanation for a decision, either on or off the field. But, at the close of play it may be possible to clear up a misunderstanding by drawing attention to the Law. Do not get drawn into any argument. An umpire should not discuss a decision made by their colleague. Loyalty to a colleague must be absolute. Umpires make mistakes from time to time. NEVER, in an attempt to be fair, level out one bad decision by deliberately making another. This is CERTAIN to lead to players losing all confidence in the Umpire. The only way to deal with a mistake is to put it behind you by applying the utmost concentration to the next action in the game. At the same time, an Umpire must not stick stubbornly to a decision that he knows is wrong and must have the strength of character to put it right. The Laws provide for mistakes to be corrected, if it is done PROMPTLY. Remember though, that problems are best avoided by a pause before a decision, followed by a firm and definite answer. An Umpire must not hesitate to consult a colleague who is in a better position to see a POINT OF FACT. The Laws allow for consultation and an Umpire should do so if he knows that is doubt on an essential point can be resolved. After consultation, the decision will be given by the Umpire who has jurisdiction on the appeal. Umpires must be confident that they have support for their actions. Here that support must come from the Association and from the B.C.M.C.L. The Association expects its members to arrive 30 minutes before the start of a match; to be properly dressed, to carry out all pre-match duties as required by the Laws, and to have the necessary equipment to properly officiate the match. If a complaint is made IN WRITING, concerning the conduct of an Umpire appointed by the Association, then the Association will investigate the mater and take appropriate action in conjunction with the governing body responsible for the match. Cricket was being played in British Columbia as soon as the British began to populate the area in the 1850's. In "British Columbia: A History", cricket was being taught to schoolchildren in 1852. Vancouver sides played in Victoria in 1884 and 1886. However, the earliest record of cricket in Vancouver is a match played on the Cambie Street grounds on Dominion Day in 1887. This match was between a team from Victoria and a Vancouver team captained by Charlie Gardiner-Johnson. Thanks to the Royal Engineers of BC, some detailed history and photos have been collected from the early years of cricket in British Columbia. The earliest reference to cricket in BC was located in 1851, when a set of cricket gear was presented to the men of the Hudson's Bay post at Fort Victoria by Capt. Walter Colquhoun Grant (formerly of the Scots Greys), BC's first private settler. By 1858 matches were held regularly in Victoria. A humorous article on August 1858 match between the town team and the crew of HMS Satellite was published. "[We] see one hundred Royal Engineers including their officers, with nearly as many civilians 'as busy as bees', some cutting down trees, some grubbing out stumps, and others piling wood upon several enormous fires, kindled for the purpose of consuming the timber. It was pleasing indeed to witness the happy reunion of the military and the citizens; but especially to see the officers for the time laying aside all distinction, and heartily uniting with the men in the arduous but praiseworthy employment of clearing the cricket ground. Shortly after two o'clock, His Excellency accompanied by Colonel Moody came upon the ground, and while the former was making himself agreeable to the people, the latter was making himself useful by taking hold, like a good fellow, and working amongst these men." [Note the not-so-subtle dig at His Excellency Governor James Douglas,not popular in New Westminster]. The ground in question was west of the Engineers' camp at Sapperton, which was on the site of the old BC Penitentiary, and east of Queen's Park. 17th May - Ho Cricketers! Awake from your slumbers and prepare for the 24th of May! 24th May - Programme for To-day: One gun when the king of the day peeps over the snow-capped peaks of the Cascade range, the signal for the ringing of the church bells. A Royal Salute at 12 o'clock, during which the bells will ring and one gun when the sun dips in the waters of the great Pacific, at which the bells will again ring. On the cricket ground a match will come off between the Military and Civilians, commencing at 1 o'clock. In addition to these there will also be canoe and boat races, Quoits and base ball, foot ball and other games and amusements too numerous to mention. The whole to close with fireworks, kindly provided by the Royal Engineers. 28th May - ... At 11 o'clock the sport commenced on the Cricket ground, and was kept up with considerable interest until 5 1/2 p.m. The contest was between 11 Royal Engineers and 11 citizens. The game was a very close one and elicited much good playing on both sides, and towards the close excitement ran high as the issue appeared somewhat doubtful; but finally the superior playing of the Royal Engineers turned the scale in their favour, they winning by 2 runs and 2 wickets to go down. At the announcement of this result three hearty cheers were given for the victors, and as heartily returned. The following year, 1863, saw a repeat of the Queen's Birthday game, and a return match in June.The 'Columbian' ran the full scorecards for both matches. The first game was a two-innings affair, and the second only one innings due to rain. The groupings for the crucial ICC World Cup qualifiers in South Africa next April are likely to pit Scotland against Ireland, with Kenya in the same group as Netherlands, Bermuda and the fast-improving UAE. The two six-team groups are based on standings in the ICC ODI rankings. Although an ICC spokesman told Cricinfo that no official announcement could be made until after the December 31 cut-off date - unless any of the Associates arrange games in the next three weeks, which is highly unlikely - then nothing will change. Group A features Scotland, Ireland, Canada, Oman, Namibia and the runner-up in the next month's ICC World Cricket League Division 3 event in Argentina. Group B has Kenya, Netherlands, Bermuda, UAE, Denmark and the WCL Division 3 winners. It is the most important Associate tournament to date. The top four countries will qualify for the 2011 World Cup, and they will also pick up additional funding which could run into millions of dollars. The top six will be awarded full ODI status, and the top eight will compete in the next Intercontinental Cup. The rewards are considerable, but changes in the rules means that with fewer places available for Associates in 2011 than there were in 2007, at least two current top-six sides will miss out. Kenya are likely to be favourites, given the fact they are a fully professional outfit and are likely to be based in South Africa for some time before the tournament. But they have had a poor 2008, so much so that Cricket Kenya has launched a major inquiry into the state of the national team. Scotland and Ireland, who both harbour ambitions to go at least semi-professional, are also likely to he there or thereabouts. Beneath them, the situation gets interesting. Netherlands are going through a transition, Bermuda, having endured a truly wretched three years, are showing signs of improvement, while UAE and Namibia have done enough to suggest they will be pressing hard. The WCL Division 3 competition could produce a cricketing fairytale if Afghanistan, who started the qualifying process in Division 5, win through. Ireland, Scotland, Canada, Oman, Namibia, WCL Div 3 runner-up. Kenya, Netherlands, Bermuda, UAE, Denmark, WCL Div 3 winner. WCL Division 3 Afghanistan, Argentina, Cayman Islands, Hong Kong, Papua New Guinea, Uganda. Group A features Scotland, Ireland, Canada, Oman, Namibia and the runner-up in the next month's ICC World Cricket League Division 3 event in Argentina. Group B has Kenya, Netherlands, Bermuda, UAE, Denmark and the WCL Division 3 winners. It is the most important Associate tournament to date. The top four countries will qualify for the 2011 World Cup, and they will also pick up additional funding which could run into millions of dollars. The top six will be awarded full ODI status, and the top eight will compete in the next Intercontinental Cup. Group A Ireland, Scotland, Canada, Oman, Namibia, WCL Div 3 runner-up. Group B Kenya, Netherlands, Bermuda, UAE, Denmark, WCL Div 3 winner. The results of the two-day meeting of the ICC Chief Executives' Committee in Cape Town were announced today, but in reality nothing of major consequence was agreed. While issues such as slow over-rates and the Future Tours Programme were addressed, there was no mention of the wider implications of the Twenty20 boom, in particular the two hottest topics, the IPL and ICL. All recommendations made in the two-day meeting will still have to be approved by the full ICC executive when it meets in January. These will include a proposed expansion of the Anti-Corruption and Security Unit to take in the wider brief of safety, security and terrorist intelligence, in the wake of the recent attacks in Islamabad and Mumbai. Further down the agenda, there were discussions on the thorny issue of players being released to play for Associate countries, although the recommendation is unlikely to appease those who are calling for teams to be forced to release them for all international matches. More general discussions were held on player conduct and the Commonwealth Games. While ICC regulations state that "participation in any form of international cricket shall always take priority over participation in any other form of cricket", the CEC recommended that this should not apply to all matches involving Associate Members. Release of players to represent an Associate Member should only be made mandatory and therefore require a no-objection certificate (NOC) from the relevant Associate Member for the following matches: ODIs and Twenty20 matches against Full Members; ICC World Cup and qualifiers; ICC Champions Trophy; ICC World Twenty20 and qualifiers; Under-19 Cricket World Cup and qualifiers. Outside these matches, the relevant Associate "would exercise its discretion in granting or withholding an NOC". With the current FTP due to conclude in May 2012, the concept of an alternative structure to bilateral tours, including the possibility of an enhanced Test championship, was further discussed at length by the CEC. There was also a general discussion on the issue of Test cricket with Members acknowledging the need to find ways in which this format of the game can be protected and promoted. The CEC agreed to recommend that the ICC should draft a separate anti-racism code to run independent from the ICC Code of Conduct. A draft code will be drawn up after receiving written comments and suggestions from Members. The CEC also looked to impose stronger action against teams bowling their overs too slowly in Tests and ODIs, and it was recommended that the relevant regulations would be reviewed. It was agreed that the role of the ACSU be expanded to include liaising and managing safety, security and terrorism intelligence matters with independent security consultants/agencies and advising the ICC chief executive and board on all matters relating to safety and security. All Full Members and the top six Associate Members have agreed to have in place WADA-compliant codes by July 1, 2009. The CEC did not back suggestions that cricket could be included in the 2014 Games scheduled to be staged in Glasgow. A team of the tournament will be selected from the Women's World Cup in 2009 and at the annual ICC Awards, the Women's Cricketer of the Year be selected using the same voting process as for the men. On the second day of the meeting there was a strategy workshop which Haroon Lorgat, the ICC chief executive, described as "encouraging". He added: "As a sport, cricket faces challenges and tensions at international level. But it also enjoys wonderful strengths. For this group it is vital that we work together for the good of the game around the world. This workshop highlighted people's concerns and hopes for the game and will hopefully in time help us develop a long-term response that will make our strong sport even stronger." 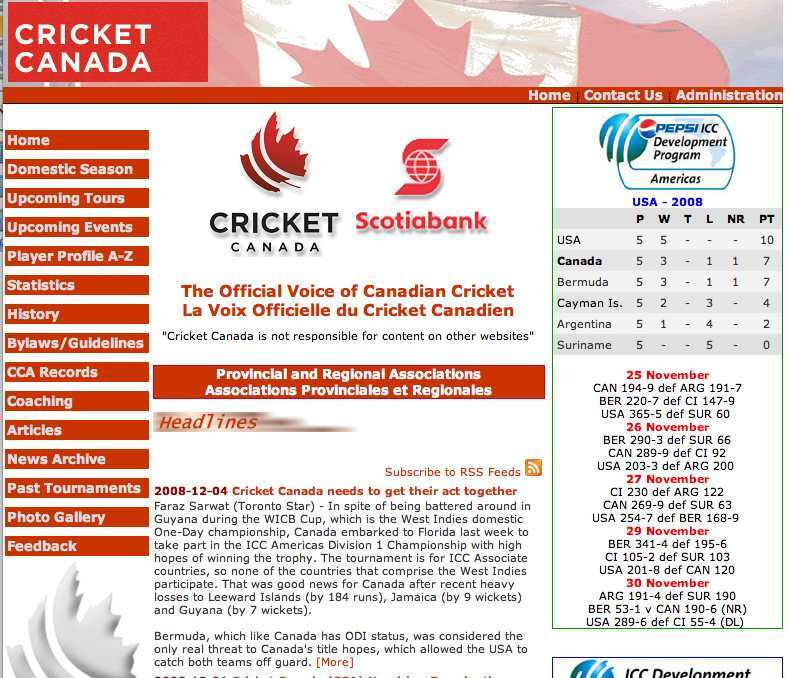 The Canadian Cricket Association website in a remarkable expression of self-criticism is advising itself on its own web site to "get its act together"! They link to an article in the Toronto Star by Faraz Sarwat discussing the recent 3rd place finish At the ICC Americas Championship.. Whether this represents an unusual act of recognizing their own deficiencies or simply reflects a continual failure to get their act together remains to be seen! The Netherlands also wore red ribbons that day and squeezed to victory against Canada to ensure winning the Tri-Nations event. Bermuda found good fortune on December 2nd when sporting red ribbons in a consolation win against the Dutch. The Canadian squad for the South African tour was included only home-based players. Overseas-based players, such as John Davison, Ian Billcliff and Geoff Barnett returned to the squad in either the tour to Kenya or for the preparations for Cricket World Cup 2007 in Antigua and Trinidad before the group matches in St Lucia . A photo of wicketkeeper/batsman Asif Mulla helped highlight the wearing of the AIDS support red ribbons. The ribbons had a visibility on the black shirt sleeves much less evident when worn on the chest of the red shirts. Mulla made his ODI debut for Canada in South Africa , progressed with the bat in Kenya early in 2007 and hit his first ODI fifty against England in St Lucia . He scored a century for Canada last week in the Pepsi ICC Americas Regional Division 1 championships. In the team photo the ribbons were only easily distinguishable on Abdool Samad and Ashish Bagai It is a coincidence how Samad and Bagai shared in the first Canadian 200-plus stand on Canada Day 2008 � July 1st - against Bermuda . This is a fitting day to remember the efforts of Mulla, Bagai, Samad and the rest of the squad in South Africa and the CWC2007 squad. Barnett and Billcliff produced Canada's first partnership of over 150 runs against Bangladesh at the Recreation Ground in Antigua in the lead-up to CWC2007 . The efforts of loyal players and servants of Canadian cricket can be recalled and thanked for efforts on this day. Some Canadian players have supported some AIDS awareness visits during overseas tours. The ICC recently celebrated its 2008 Diversity Day. Canada and Canadian cricket has a lot of diversity. The way the players have pulled together on tours, which can be very tough, for those who think it�s a holiday going to some �exotic locations�. Diversity Day, World AIDS day, Remembrance Day and various annual celebrations and cultural events are included in the mix of regular observances at the Federal level, Provincial level and local levels in Canada . The Canadian women's national team won the inaugural 2007 ICC Americas Regional Womens� Championship in 2007. The women�s side also reflects the diversity of heritage in Canada , and Canadian cricket. The squad included players with English, Australasian and Japanese heritage as well as some with a similar mixture of Afro-Caribbean, Indo-Carribbean, African and South Asian players seen on the men�s side of Canadian cricket. The Canadian women�s team had a five match tour of Trinidad and Tobago in April 2008, the first tour outside Canada , and were the first national team to carry the Scotiabank sponsorship on a national team�s shirts. The underlying spirit of cricket aims to bring people together through the game and to show respect for each other, regardless of personal background and heritage/culture. Canada had the most diverse squad at Cricket World Cup 2007 in the West Indies . It was not widely realized that the Canadian "South Asian contingent" in the CWC 2007 squad had mostly developed cricket skills in Canada . Qaiser Ali was the one squad member with one List A one-day match for Rawalpindi B in South Asian domestic cricket. His first class cricket has all been for Canada . The likes of Asif Mulla, Ashish Bagai, Umar Bhatti were born in South Asia but represented Canada at Under-19 level or even the ICC Americas Development U19 squad involved in the 2000 U19 World Cup. Bagai�s international record can be traced to the 1996 Canada Under-15s. Abdool Samad played for Canada at junior national level after being born in Guyana . World Cup captain John Davison, underlined Kevin Sandher was an example of a Canadian-born and bred player. Sandher comes from Vancouver , British Columbia . Too often, people seem to jump to conclusions in life, as well as cricket, without doing any research or due diligence. And there's a difference between the puritanical, rose-tinted view of cricket that reflects what most would like to see, but what sometimes happens or has happened. Given the proper will, direction, planning, funding, supporting infrastructure and communications cricket could become more visible in both Canada and the USA . But it takes constructive leadership and some of Richie Richardson's "hard work behind the scenes" to turn the corner. He spoke in Toronto in April 2006 on his concerns over cricket in the West Indies . I was at an event at the University of the West Indies where Professor Hilary Beckles cautioned "it is easier to lose a cricket culture than to build one." USA was number 1 in Americas cricket when the first West Indies tour took place. Next year is the 100th anniversary of the founding of the ICC, which originally was "Imperial" - British Empire only. So, no USA in the Imperial setup, which helped stem the progress of cricket in the USA . Beckles was concerned about the loss of a cricketing culture in the Caribbean , as are many others. Many of the people suffering from HIV/AIDS are poor and lack education. Many babies are born with the HIV virus. Mention of the disease still has a great stigma. At a seminar last week I heard how a judge in Canada had ordered someone involve in a case about HIV transmission to wear a facemask in court. Apparently the judge thought the disease could be passed through the air. What price equity and respect in this world, by showing honesty, integrity and love to fellow human beings? Music gives some lines that can tie in with the spirit of cricket and of showing respect to others, including those suffering the effects of HIV/AIDS, their families and friends. Especially during times of trouble with the global economy, the terrorist actions in Mumbai and problems in far too many counties, including poverty and educational deficiencies for many of the world�s population. �What the world needs now is love sweet love rather � than the "Money, Money, Money" of the rich man�s world. But Abba hit a certain reality with that song and with �Thank you for the music�, Music, like cricket, a potential source of relaxation and enjoyment for many but sometimes a tough grind for international players, especially players in the ICC High Performance.countries with needs to balance work and cricket. Sports and music are interests that can be loved and bring people of different backgrounds together and, hopefully, help them learn to live, work and respect each other. An ability to understand and see ourselves as others see us can be a key quality. Many love cricket. Love and thank you messages should be extended to special people. But shouldn't that include all of us on this earth? Richness can stem from true friendship and love, and make all of us special. People with HIV/AIDS need love and understanding. Love of cricket can be found through the game�s rich literature and study of its social history as well as from the playing and watching. A Canadian entry in the ICC Development Awards won the Spirit of Cricket/AIDS Awareness regional award in 2006. The nomination underlined the role of the organizer of the Ontario Colleges and Universities tournament and the participating players. There was no mention of this success in the Canadian Cricket Association section of the subsequent ICC Americas yearbook. But there was bandwagon jumping over two other Regional wins for Canada that had gone on to win the ICC Global awards. What real contribution had some Canadian cricket leaders made to the winning of these awards? Perhaps HIV/AIDS carried a stigma to some in cricket, but look how the ICC tied the AIDS Awareness award to the underlying spirit of cricket. �Self-praise� and big egos can carry a stigma in the eyes of others. Sometimes self-praise is justified, but that depends on how actions reflect and improve on mere words and intentions. Surely self-praise is appropriate only if you are being true to yourself. Certainly not when taking credit for the ideas and works of others. Professor Sanjay Talreja saw ongoing circles and cycles in his life and in cricket in his film �Cricket and the Meaning of Life� . Respect and love of cricket and life - cricket as its own creed in a way - were keynotes from the panel at Toronto �s Metro Hall in April 2006. A chance sighting on the Aboriginal Peoples� TV channel made me aware of the Seven Teachings, or laws, fundamental to some First Nations cultural beliefs. Each teaching boils down to one word, those words being: courage, honesty, humility, truth, wisdom, respect and love. Words that surely summarize many other people's core values for life. But each person must demonstrate those underlying beliefs with actions. And may need have access to the educational resources, formal or through the university of life, that support true understanding of each teaching. AIDS/HIV infected people often need to dig deep into some of those core values in everyday life. As do cricketers, captains and umpires out on the international cricket field. As might all people as an integral part of life: if some could only open their eyes, ears, minds and hearts.